Calling all dog lovers! Pop Up Dog Cafe opens in Vancouver. On August 5th, the B.C. 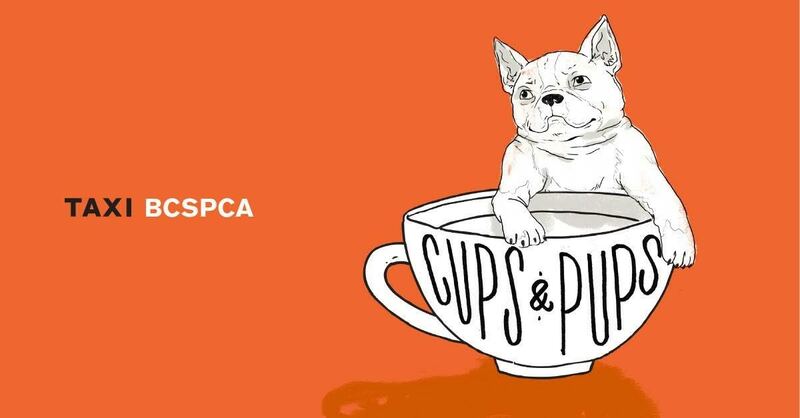 SPCA and Taxi Global Cafe will host a pop up dog cafe in Vancouver. Just $10 donation gets you in the coffee shop to meet some furry friends available for adoption. Representatives from BC SPCA Vancouver, Burnaby and West Vancouver branches will be on site to answer questions on adoption. Adopt, don’t buy! See you there tomorrow! Stop by to meet some cute puppies and hopefully there will be a match! The 38th annual Vancouver International Wine Festival eight day event between February 20 – 28, 2016 came and went just like that. This year’s theme country focuses on Italy with 155 Wineries and 14 Countries. Aside from the Tasting Room itself, there are lots of wine events including Winery Dinners, Wine Seminars, Wine Minglers, popular Vintners Brunch, etc. The wine festival’s tasting room is a great place to familiarize yourself with different species, discover new wines and return to your favorite premium wines. VIWF celebrates its new charitable beneficiary The Bard on the Beach Theatre Society – one of Canada’s largest not-for-profit, professional Shakespeare festivals. I remember the first time I went to a Wine Festival many years ago. Thinking back I was such a noob. Meaning… I was drunk before I even made it past the second row. It’s all laughs and giggles now, but gosh I had to sit down. If you’ve never been to a wine festival, you should! It is also useful to familiarize yourself with a few etiquettes to help you feel more comfortable. Here you 10 useful tips to maximizing your wine-festival enjoyment! Eat: A wine festival is not a food event. Make sure you have a meal before you arrive and snack throughout your time at the festival. Food samples (ex. crackers, cheeses, olive oil and bread) are available to enhance your wine tasting experience. Footwear: Expect a lot of walking and standing. For example, the Vancouver International Wine Festival is held at the Vancouver Convention Centre and has carpeted floors. Wearing heels will tire you out quickly. If you are at an outdoor wine festival, you may take a guided tour that leads you into a vineyard (gravel, green lawn). Better to trade in your heels for a pair of feel good footwear like these or these. More Room: If you want more room and time to try the wines and to talk with the winery principals, option to attend Thursday evening and Saturday matinee sessions. Fridays and weekend evenings are most busy. Sip and Spit: If you swallow every wine you taste you will be drunk pretty quick! Each booth will have spittoon/container for you to spit and pour your wine away. Don’t think of spitting as uncouth. Only drink the wines you absolutely adore! No Perfume: Please don’t wear perfume, cologne or overly scented personal products. Your scent can impact others tasting experience and you will upset a lot of people. Designated Driver: Bring along a designated driver. Or take transit. BC Liquor Stores offers a free transit ticket at their Get Home Safe booth as you exit. Another great option is to book a hotel room for the evening. Keep Score: Keep track of your wine tastings of what you like. Keep track of the wine and what you liked about the flavor. This will help you remember which wines you liked the day after if you wanted to purchase them at your local liquor store. Free bottle check/Wine Delivery: The Vancouver International Wine Festival offers free wine bottle checks. All wine served are available for purchase. Make sure to ask the winery principal if the one you like is available for purchase at your local liquor store. Some are sold in very limited supply at the festival itself like this creamy marmalade Oyster Bay Riesling Botrytised 2011. Wear White with Caution: I would suggest not to wear white unless it’s the color in your wardrobe. Be caution of spilling or other people bumping into you. If you must, bring an instant stain remover with you ok? Have Fun: Seriously. Have fun! The Vancouver Hot Chocolate Festival 2016 present by CityFood Magazine is back for the 6th year! It will be between January 16 – February 14, 2016. Just in time for Valentine’s Day! To coincide with Dine Out Vancouver 2016, make sure you loosen your belt buckle and come try 24 participating cafes and chocolateries. These Chocstars will not only spike their hot chocolate drinks with the wildest, most delicious flavors you can imagine. There will be over 57 sweet chocolate flavors Vancouver Hot Chocolate Festival 2015 during the 29 Days. Flavors range from almond, balsamic vinegar, black sesame to bugs/crickets to Earl Grey and bergamot to scotch. What will be your favorite? 49th PARALLEL COFFEE ROASTERS + LUCKY’S DOUGHNUTS – New! BUTTER BAKED GOODS – New! DIVA AT THE MET – New! EARNEST ICE CREAM – New! GLENBURN SODA FOUNTAIN & CAFE – New! 2015 EAT! Vancouver Food + Cooking Festival will be a week long festival taking place throughout Vancouver between April 26th to May 3rd. The featured eight day long culinary culture and festivities included hands-on workshops, collaborative chef dinners featuring top chefs from across Canada, Canadian Flavours Gala, a hospitality symposium, a pastry panel and the ultimate consumer food showcase at BC Place Stadium May 1st to 3rd. We hope that you were able to attend some workshops and the Dinner Series being hosted by many top Vancouver restaurants and chefs. Many were Sold Out in a blink of an eye! Otherwise, I guess there is always next year! PRANA nuts and dried fruits. My favorite was the dry figs. Pure Leaf Iced Tea has us thinking of summer drinks already! Everyday Superfoods It’s Not Bacon Coconut Snack: It’s Not Bacon! Made with Coconut flakes! All natural, vegan, gluten free and Non-GMO. We knew coconut was big last year. Now, coconut as fake bacon? That’s just ludicrous (in a good way)! Ener C: natural fruit flavoured Vitamin C focused vitamin drink mix, will leave you feeling refreshed and energized. New Pineapple Coconut Vitamin C drink. Italissima reduced Balsamic vinaigrette is pretty handy for bread! SIP lounge serving alcoholic beverages. What happens in SIP stays in SIP! You will just need to come by next year to experience this for yourself! Of course and go fishing with Mike’s Hard Lemonade!